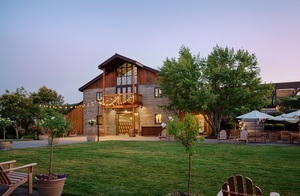 Well-timed for summer, Murrieta’s Well offers guests an expanded array of events and experiences on their Livermore Valley estate; pairing their acclaimed wines with live music, seasonally-driven cuisine, guided hikes and more. Elevate your Happy Hour tradition with live music, Murrieta's Well wine and delicious bites crafted by the in-house culinary team while enjoying a view of the rolling hills and setting sun over the picturesque Livermore Valley. Wines are available for purchase by both bottle and glass. Happier Hours begin at 5:00 pm on most Thursdays this summer. Reservations are required. Expand your wine tasting skills and knowledge with an estate ambassador in a seated, small group tasting. You and your guests will be guided through a tasting of limited-production, Bordeaux-influenced estate wines while learning about the rich history of the property. For a broader experience, guests can enjoy food offerings prepared by the in-house culinary team. Reservations are required. Find your perfect pairing with a specially designed food and wine experience offered by the property’s chef and culinary team. Begin with a tour of the estate, glass in hand, followed by a relaxing seated tasting in the historic barrel room featuring seasonal bites paired with four of the estate wines. The experience runs every Friday, Saturday, and Sunday at 11:00am and lasts approximately 90 minutes. Reservations are required 72 hours in advance and are available for 2-12 guests. Cancellations must be made 48 hours in advance. Enjoy panoramic views of the Livermore Valley, picturesque wildlife, and the expansive estate vineyards on an educational and panoramic hike above and around the property. Guests will see firsthand the acre-by-acre, small lot approach to grape growing and winemaking for which Murrieta’s Well is well known. After the hike, guests can relax and taste through award-winning wines, while enjoying small bites from the culinary team. Hikes are scheduled on select Sundays through the summer and require closed-toe shoes. Reservations are required. Please visit www.murrietaswell.com for specific timing and reservation information. Murrieta’s Well, located in the Livermore Valley, is one of California’s original wine estates. Celebrating 135 years of grape growing in 2019, the estate began in 1884 with cuttings from famed French vineyards Chateau d’Yquem and Chateau Margaux. Acclaimed winemaker, Robbie Meyer, creates all Murrieta’s Well wines with a small lot approach; farming 100 acres of vineyards block by block and crafting wines barrel by barrel. This creates an opportunity to blend exceptional wines that truly showcase the unique characteristics of the estate’s terroir.